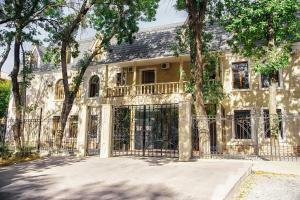 Renaissance Aktau Hotel is perfectly located for both business and leisure guests in Aktau. The hotel offers a wide range of amenities and perks to ensure you have a great time. All the necessary facilities, including free Wi-Fi in all rooms, 24-hour front desk, luggage storage, car park, business center, are at hand. Designed for comfort, selected guestrooms offer air conditioning, heating, desk, mini bar, soundproofing to ensure a restful night. Recuperate from a full day of sightseeing in the comfort of your room or take advantage of the hotel's recreational facilities, including fitness center, sauna, outdoor pool, indoor pool, spa. A welcoming atmosphere and excellent service are what you can expect during your stay at Renaissance Aktau Hotel.